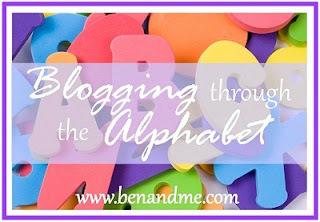 This is my first week participating with Marcy on her Blogging through the Alphabet adventure. I'm starting very late since this week is letter T.
My pick is T is for Trust. Trust is something that is earned not just something that is given. Do you trust your children? Just when I think I've made some huge progress I get showed that they are indeed still children. The kids went outside to play on one of our not raining days. We've been getting so much rain lately. They played out for a while and then Zachary came in and asked if they could play with their airsoft guns. I didn't have a problem with it simply because they understood our rules for using them. See the airsoft guns are something both of my boys have gotten into loving. My nephew is a year older than Kyle and goes to public school and he informed Kyle right at Christmas time that his friends and he enjoy having an airsoft war. How did hubby and I find this out you may be asking? Well because they were going to have one. Kyle asked for some of our science goggles and I don't normally question them simply because I love for them to use their imagination. Sad to say I may ask next time when its "off the wall". They got goggles and proceeded to shoot each other with airsoft bb's. It's the new thing! I mean what kind of mother and father would we be if we didn't allow them to pursue ideas as others do? Needless to say they have been grounded from the airsoft guns for almost 2 weeks. The 2 week period was up on this given day and they asked for them after being outside playing some more. I reviewed the rules for having them and everything was understood. What to my amazement happened? They shot each other again. My smallest started it and my oldest decided since Zachary had done it first he would just follow. So much for the oldest being a good role model! I knew to keep an eye on them and needless to say they had a little fit when they noticed me watching. I told them to bring them in and place them on hubby and my bed. That we would talk about this when daddy got home. Then the crying starts just because I normally take care of things so they knew they crossed the line when "waiting for daddy to get home" was used! Daddy comes home and sits down at the table for a talk. DH asks them why they broke the rules. Zachary said "because daddy we are idiots!" Kyle denies doing any shooting. He lied 3 times before confessing to shooting and being in on it with Zachary. The lying got him a spanking. That is the one rule that I enforce with GREAT CONSISTENCY. I can't stand to be lied to; I can't stand a liar, especially from my children that I sacrifice everything for. Not only did he lie to hubby and I but the example that it sets for my other 2 children is unacceptable. Don't get me wrong, we do not punish this way normally, but you can only tolerate so much sin in your home and for me it’s lying. I guess it comes with a sense of trust. A liar can't be trusted. It takes years to repair lies. Just like a theft, you wouldn't trust them. They are no different than a liar. My children are great kids. They make mistakes just like I do. I remember being a child and lying! It’s part of childhood and exploring and growing into who you are going to be. All have sinned and come short of the glory of God. Lying is something we take seriously here too! Thanks for the reminder of how serious it really is! I hear you on this, it's the same in our home. We feel the same about lying, too. Great post! Oh... my daughter who is 5 turns out to be a fantastic liar. It really worries me! She colored on my sisters wall and for a week completely denied doing it! I truly believed her.